The Spanish City in Whitley Bay is set to open this summer and jobs are already being advertised in preparation for this. Vacancies include opportunities in hospitality, maintenance and administration (The Chronicle). Private dental practice, The Cosmetic Dental Clinic, who are based in Newcastle are opening a new clinic in Durham, creating seven jobs. The practice offer both cosmetic and general dental care (Business Durham). Newcastle based customer contact centre, Echo-U North are creating 100 permanent customer service advisor jobs (Bdaily). Customer Service, Retail and Hospitality Jobs Fair in Newcastle - Thursday 26th April, 12 - 3.30pm, Milburn Suite, St James Park. To sign up go to www.apriljobsfair.eventbrite.co.uk or call the Skills Hub 0191 277 4125. Jobs Fair - Spennymoor Leisure Centre - Livin Housing are hosting a jobs fair in Spennymoor Leisure Centre on the 24th May between 9am-1pm. Cobalt Jobs Fair, 3rd May 11am - 3pm at Cobalt 23. Transport will be available from Wallsend, Howdon and Meadow Well. A report from Sir Michael Fallon MP (ex Energy Minister) and his visit to Tees Valley has given hope that the government will be looking to improve the contribution of local companies to the offshore wind market. The report was commissioned by local engineering firm Wilton Engineering and it presents the case for setting a 60% target for the proportion of UK companies in the manufacturing, installation and maintenance of wind energy. The outcome would be more business and more employment for local companies. Skills for care has published a report on the pay trends in the care sector since 2011/12/. The key finding is that reasuringly, the average care worker was better off, in real terms, by 45p per hour in February 2018 than they were in September 2012. Thought provoking article from Prospects Luminate, which explores themes which are influencing the graduate labour market in 2018. These themes include Brexit, automation, soft skills shortages and graduate job seeking behaviour. Gatsby has published "Good Career Guidance: Reaching the Gatsby Benchmarks," a handbook for schools containing information to help schools on their journey towards implementing the Benchmarks. Using data from the Labour Force Survey, the APS provides an estimate of the count of employment by occupation (using SOC 2010) at a regional level. 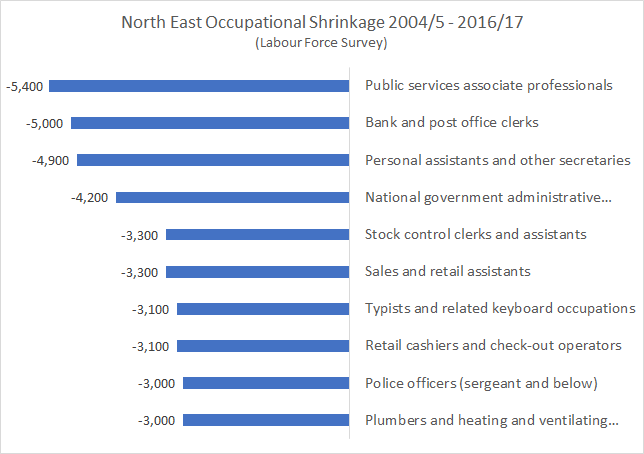 Looking back over a longer period shows where the growth and shrinkage in occupations have been.To do your own analysis look here on Nomis. 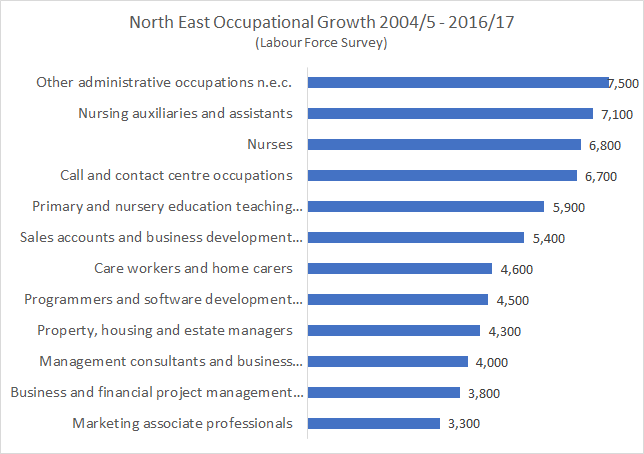 The charts show the occupations that have seen the greatest increase and decrease in numbers in employment in the North East region (that's the old North East region from Berwick to Redcar). A fuller list of occupational changes will be published in the next fortnight.